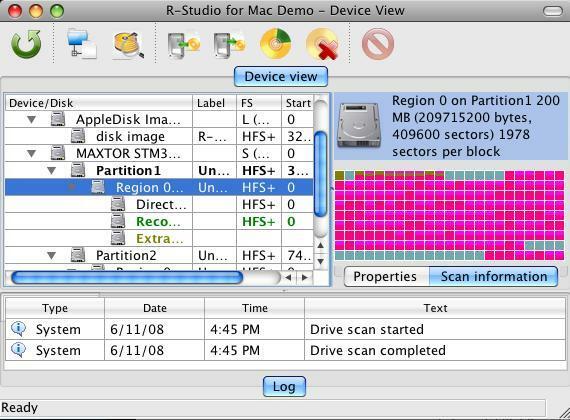 R-Studio for Mac is powerful and cost-effective data recovery software for Apple lovers. R-Studio for Mac is specially designed for Mac OS environment and recovers files from HFS/HFS+ (Macintosh), FAT/NTFS (Windows), UFS1/UFS2 (FreeBSD/OpenBSD/NetBSD/Solaris) and Ext2FS/Ext3FS (Linux) partitions. It also recovers data on disks, even if their partitions are formatted, damaged or deleted. Additional file recovery algorithm increases the quality of file recovery and recovers files not recognized in file system metadata. Dynamic disk and RAID are supported as well as recovering data forks, resource forks, finder information and UNIX file system permissions, encrypted files, compressed files and alternative data streams. Files and file systems structures (HFS/HFS+ data forks, resource forks, NTFS/FAT boot sectors, MFT file record, MBR, LDM structures, etc) can be viewed and edited in the professional disk hex editor. Flexible parameter settings give you absolute control over data recovery. Contact & Other Software of R-tools technology Inc.